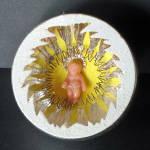 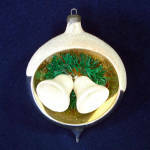 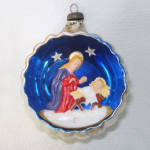 A rare diorama scene type Christmas ornament from 1950s West Germany. 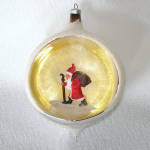 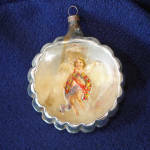 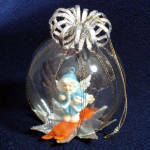 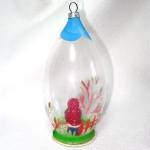 It's a 4-1/2 inch high transparent glass teardrop with a little ceramic or clay composition Santa Claus figure standing inside. 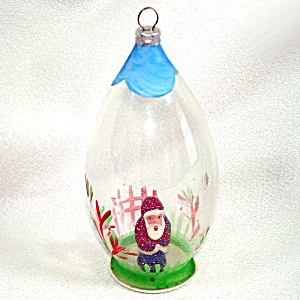 The lower third of the glass is painted with trees, grass, and a fence. 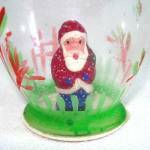 The inside of the glass has a smattering of tiny white specks. 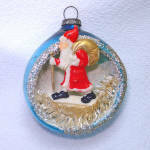 Since there is no glitter on the ornament, the little specks are probably meant to represent snow. 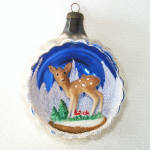 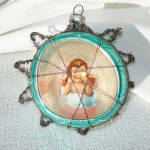 The ornament is in excellent vintage condition with no damage. 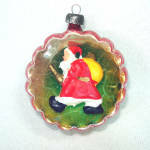 The Santa figure has some age crazing.